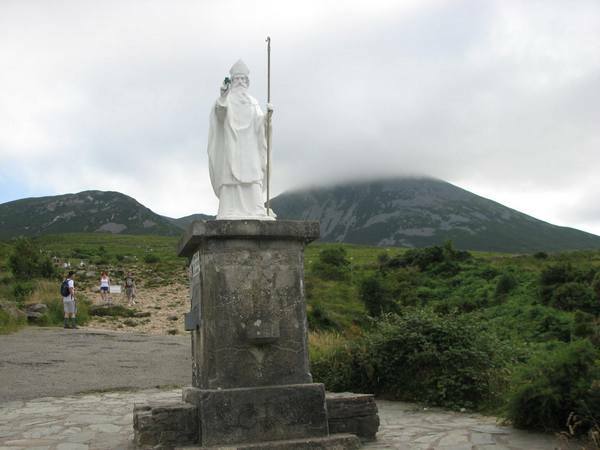 Saint Patrick, wielding staff and shamrock, greets climbers at the bottom of Croagh Patrick. 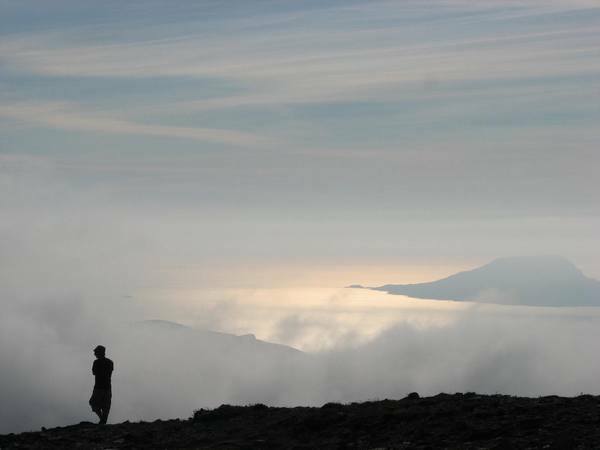 The mountain has been the site of sacred pilgrimage for several thousand years, and the scarf of mist that cloaked the summit gave it a suitably mystical atmosphere. Though not a tall mountain (2500ft. approx. 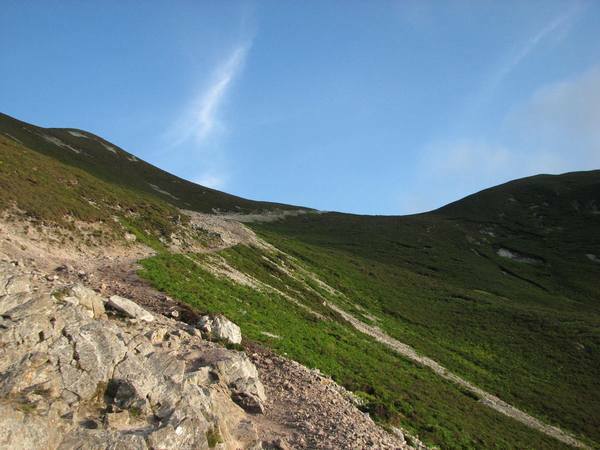 ), the ascent is steep from the start, and treacherous further up when the route turns from rough rock and dirt to scree that makes it hard to find reliable purchase. Here’s the view after a few minutes’ climbing. 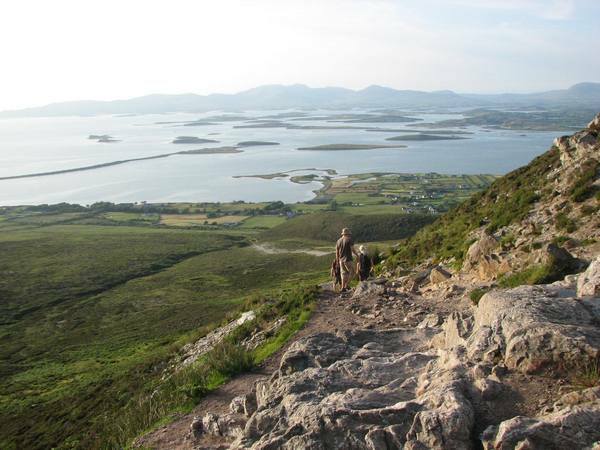 In the background is Clew Bay, which opens Mayo up into the Atlantic; beyond it, the county’s Nephin Beg mountain range. The early-evening weather was perfect: warm in the sun, mild out of it, dry and breezy. As we climbed we left behind a stream and its neighbouring greens, heather purples and wildflower yellows and whites and everything turned grey and brown for a while. Towards the summit we entered the mist we’d seen from sea level and all was muted. Looking west we could see Clare Island silhouetted against the shimmering surface of the bay. And on the other side, fields and forest stretch off amid lakes and hills in a hazy green expanse. 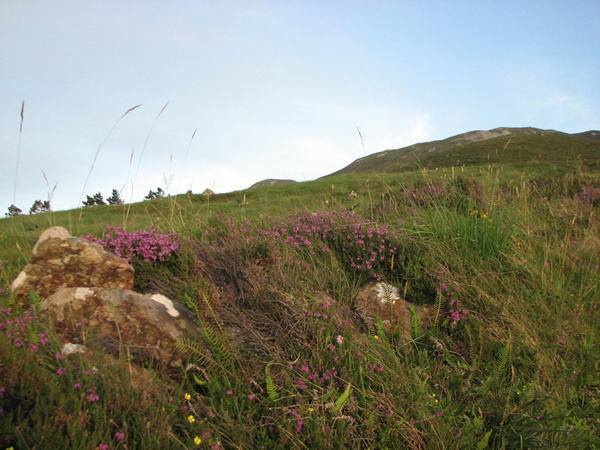 There’s enough greenery below the scree to keep sheep in good health on the mountain. We descend. It was tough on the thighs going up and on the calves going down. Anecdotally, tumbles and slides are common, but our party survived with nothing worse than tired muscles, creaky joints, and one bloodied toe. 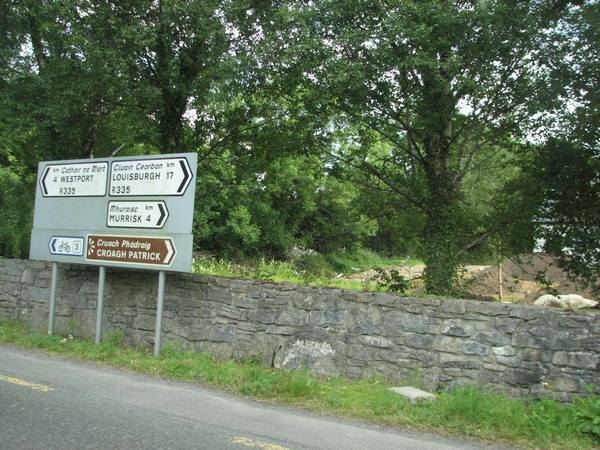 This entry was posted on Friday, July 19th, 2013 at 10:21 am and is filed under Ireland, nature, photography, stories. You can follow any responses to this entry through the RSS 2.0 feed. You can leave a response, or trackback from your own site. Lovely photos, Stan. 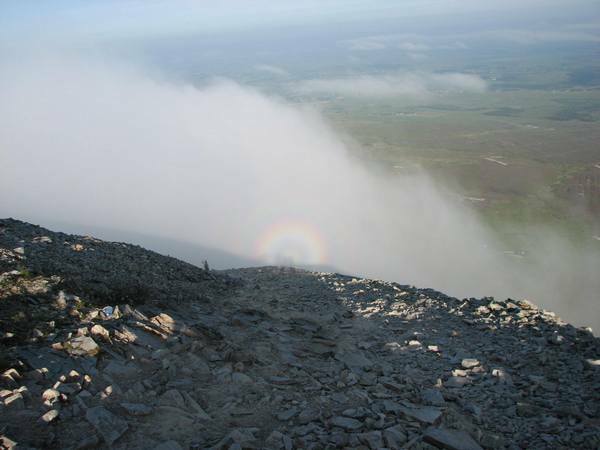 Is the small rainbow a Brocken spectre? Thanks, Niall. That’s exactly what it is. I’d forgotten the name for the phenomenon. Lovely post! 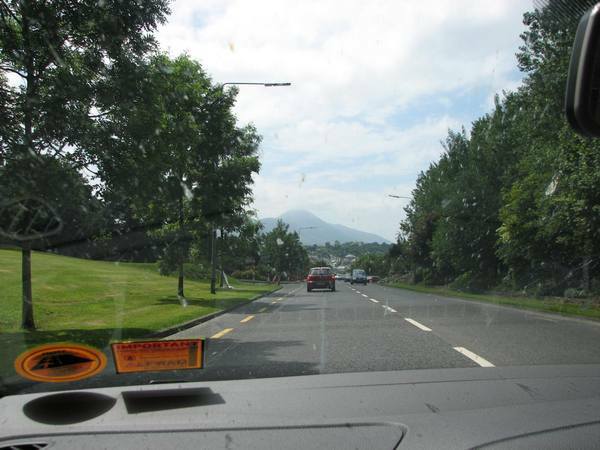 I haven’t seen Croagh Patrick in almost 30 years. Thank you. Is there any tradition of why it’s called “The Reek”? Dr. Google is not helpful today. 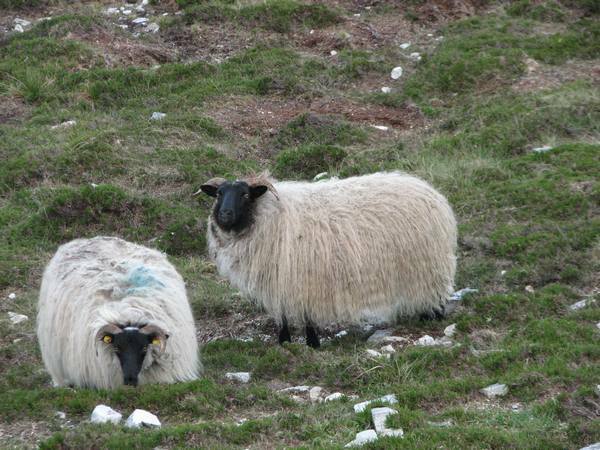 In the west of Ireland, “reek” can mean “heap” or “pile”. In particular, one piles sods of turf into a reek. I’m guessing that this name comes from its resemblance to such a reek of turf. Or maybe it is because, since it is mostly scree near the summit, it resembles a pile of stones. 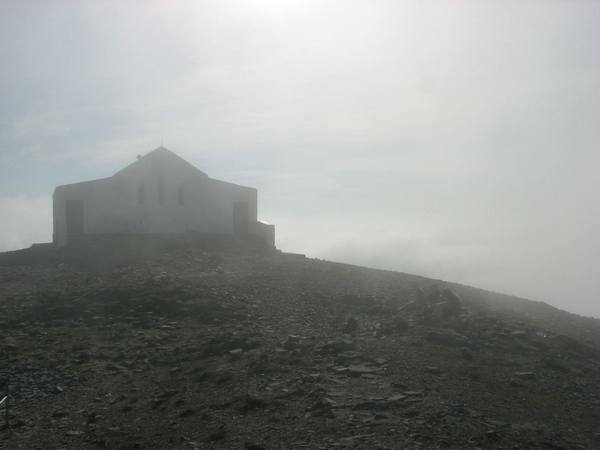 So, you had Croagh Patrick for yourself, hm? How lovely (that must have been). Lovely photos, my friend. And obviously there was nicer weather than on that last Sunday in July, 1985. By an astonishing coincidence, I first learnt about this place just the other day in a book by Jan Morris. She makes it sound very gruelling with people doing it barefoot as Sean J mentions. 4thEstateX: My pleasure! It hasn’t changed much at all in the years since I last climbed it. John, Niall: I think Niall has the right general idea. It’s effectively the same as a rick (reke in Middle English); the mountain’s conical shape as viewed from some angles is suggestive of a rick of hay or similar. 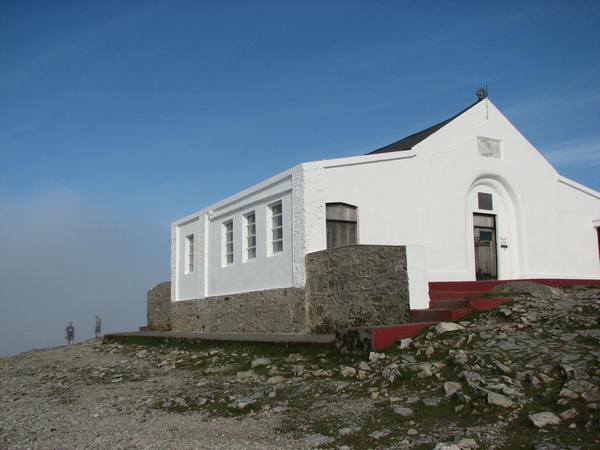 Robert Lloyd Praeger has a fine passage about Croagh Patrick in his book The Way That I Went, and in which he interprets the name as “St. Patrick’s rick, commonly shortened into ‘The Reek'”. Sean: It was a little busier than my photos might make it seem, but in no ways crowded. We were lucky in that respect. I decided against going barefoot – sandals up, runners down was my strategy – and am impressed that anyone manages this; it is no mean feat, or perhaps feet. “A great sinner”, incidentally, is marvellously ambiguous. Peter: That is a nice coincidence. The climb is quite challenging; I saw a couple of very fit people jogging up the slope, but even walking it is a workout. WWW: It was like a mini-sabbatical. No choice but to leave a lot of stuff behind, if only temporarily. 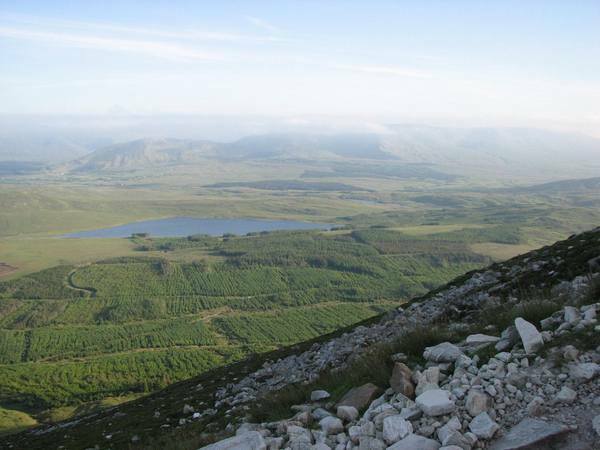 The highest peak in Ireland is in Macgillycuddy’s Reeks, named after the McGillycuddy clan, whose chief was “The McGillycuddy of the Reeks”. Marvelous post and photos inviting us to follow you all the way. Glad that it wasn’t on one’s knees, and in constant prayers, as it’s done on 283 steps, at a Montreal Oratory. My long ago last and only attempt at a climbing pilgrimage, at the age of 15. The Irish one seems very refreshing for the eyes and spirit, and certainly invigorating for the body though a bit painful for the feet. Thank you for sharing. Originally described a rick, as of turf, but is also applied to mountains or hills – sometimes an isolated, symmetrical peak, sometimes a ridge, or range, of mountains. 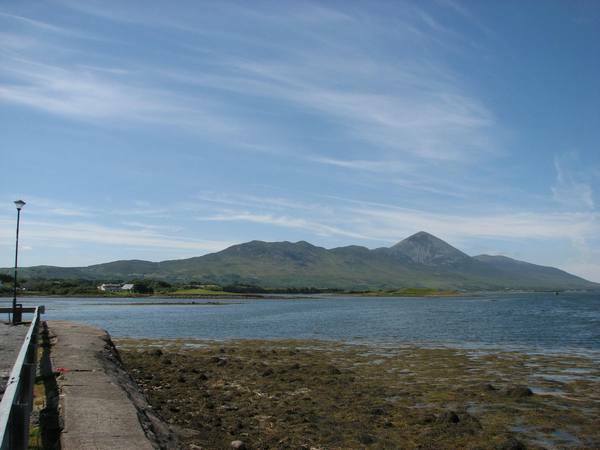 It is usually Anglicised in place-names as ‘croagh’. 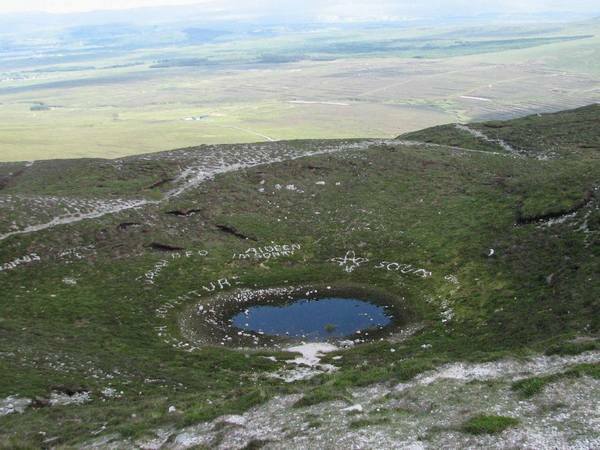 Also worth mentioning for their use of “stack” are Donegal’s Bluestack mountains, Cruacha Gorma, literally “Blue ricks”. Claude: Thank you. 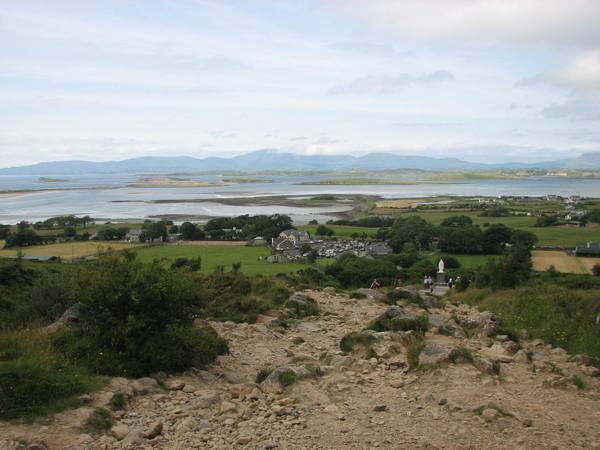 Your pilgrimage sounds quite similar to those done on Lough Derg in Ireland, where penitence on one’s knees is very much part of the experience. 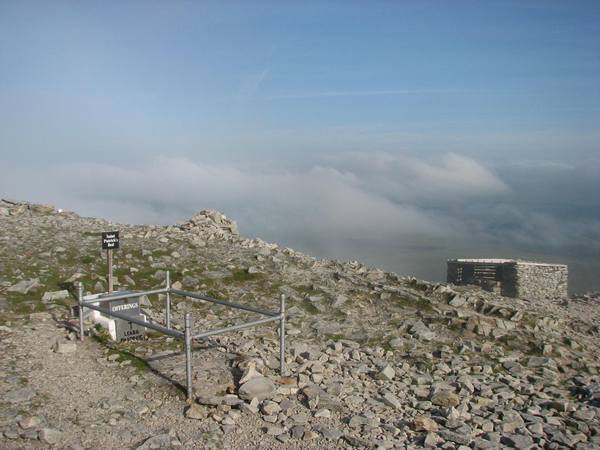 Climbing Croagh Patrick – upright – was indeed refreshing and invigorating; next time, I’ll try at least part of it without footwear. Thanks for the information on the origin of “Croagh”. I had long assumed it was derived from “cnoc”, which in Connemara is typically pronounced “croc”. You’re welcome, Michael. An origin in cnoc would seem perfectly plausible, but cruach is well established as the true etymology. Indeed, when the English spellings of Irish names were established, either gh was still pronounced /x/ (as in Irish ch), or at any rate that pronunciation was still remembered. The same is true of many place names in America of indigenous origin. The village of Usquepaugh, Rhode Island, looks very Hiberno-English, but it is in fact Narragansett for ‘[place] at the end of the pond’ (pond in New England being a spring-fed body of water of any size, as distinct from lakes, which are stream-fed). It is usually spelled and pronounced Usquepaug nowadays. The hamlet of Weekapaug in the same state is another version of the same underlying name. In my own state of New York, Taghkanic, meaning ‘in the trees’, is the name of a town and a river; the nearby mountain range and highway are spelled Taconic, which shows the current pronunciation better. The oldest form,Taughannock, is still the name of a waterfall. Similar inconsistencies give us places and things variously named Allegheny, Alleghany, Allegeny, Allegany, the pronunciation in all cases being al-uh-GAIN-y. Something similar happened with loch, anglicised as lough but generally pronounced /lɒx/ either way (or sometimes /lɒk/).